There was a green stamp store in Marlow Heights MD right next to Iverson Mall. I think my parents got a BBQ grill there one time after collecting those stamps forever. I posted the image of the stamps on another of the GoGoMag message boards and someone indicated that there still stores in the south that use redemption programs. I beleive that those yellow stamps were called 'top value stamps'. They weren't as prevelent as the S&H green stamps, at least not where I lived south of Alexandria. You're right, zapper. Thanks for the post. My mom collected both the yellow and green stamps. I collected them for a number of years after I grew up. I probably still have some of the things I got for them. It seemed like it took forever to get enough books to get anything. If I looked hard enough, I might still have some of the stamps. 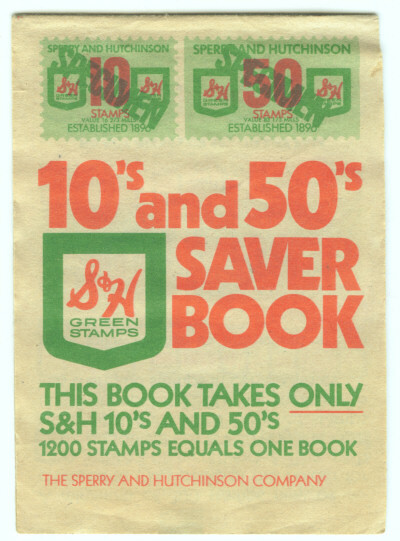 I remember my parents getting S&H Green stamps at Grand Union. Do you remember anything you or your parents bought with them? LOL No I don't! I'm going to have to ask my mom! Edited to add: my mom said we got an ashtray! LOL It's one of those on a stand! I think the ashtrays and lamps were pretty popular stamp-purchases. I remember getting mostly small appliances like toasters, hand mixers and the ubiquitous waffle irons. The waffle irons then were made with plates you could flip from waffle to smooth griddle...made great grilled cheese sandwiches. ...crockpots. My Mom was always killing them so stamps bought new ones when the old one died. Killing them?? She must have used them everyday! I still have (and use) the one I got as a wedding present in 1981! I recently bought a big fancy one and it has a hot spot that burns food every time! Don't make them like they use to.